Had a bad migraine today. Still did office work and taught Wed. School. While I was reading the news this evening I came across this video. Some of you have seen it. I don't know if I should laugh. I suppose I should feel pity for the man, but he chose to break into the liquor store. 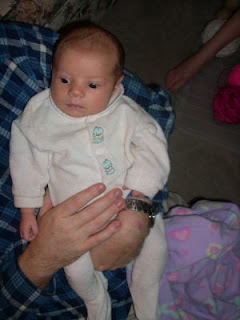 Inge is one month old today. She is awfully nice to snuggle. She sleeps most of the night. Sometimes she is a bit clingy, but she's only a month old. Remember the markers? 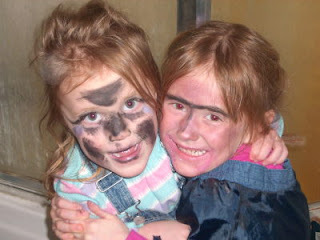 Well, this is "makeup" and it was for a play for the kid's tutor. I didn't see the play. But this "makeup" still didn't wash up easily. Grrr. For Sauerkraut the ingredients are simpler: Cabbage, Salt, Water, and any flavorings you want. I like a bit of Fennel and Mesquite. 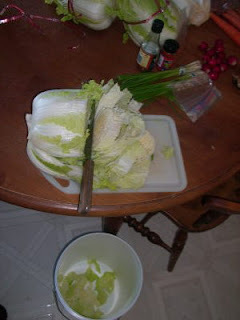 Slice the cabbage into nice thin sections, the thinner the better for fermentation. Fill the bucket. 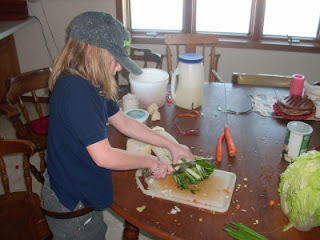 Add water to cover the cabbage. Add any seasonings. Then salt the water to the point that you would just be able to drink it, and not more. Regular cabbage takes a bit longer to ferment than Napa Cabbage or Bokchoi because it is more fibrous. I put it in a food-grade 5 gallon bucket with fennel and a few cloves of garlic. I put a plate on top of it to keep it underwater; weigh down the plate. And then I cover it and let it sit for a week or two. The big bucket in the back is sauerkraut. I also have a gallon jar of whole cabbage leaves fermenting in the same way. You can see this in front of the plastic bucket. 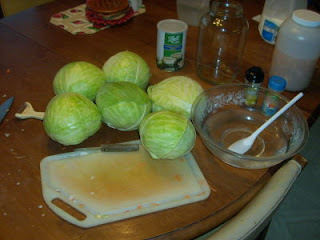 We'll use the fermented cabbage leaves later for stuffed cabbage leaf recipes. I saved the cabbage hearts from the Napa, Bokchoi, and regular cabbage. I have also brined these in saltwater and whey. We started this in the late afternoon when I was back from shut-in visits. Already the cabbage is starting to ferment and smell really good. Now I'm hungry. Where did that come from? This post is a kind of "build-along". Today we made kimchi and sauerkraut. Both delicious, nutritious. Both depend on friendly bacteria rotting the vegetables to make them taste good and be good for us. 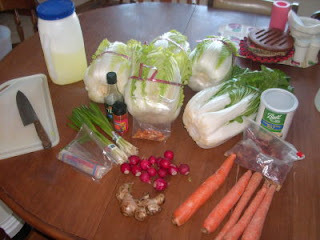 So let's start with the ingredients for kimchi. Remember, we have 10 children. So we make things in large batches. 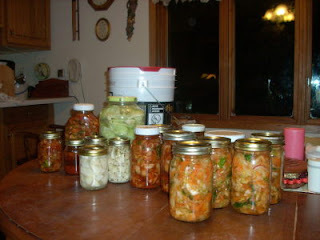 But even so, this kimchi cost us about $7 to make. What we'll get is about 3 or 4 gallons. 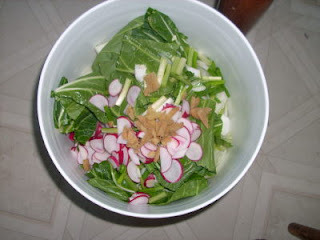 You can see the Napa Cabbage and the Bokchoi, the radishes (no grocery store had Diacon radish), scallion, garlic, ginger, peppers, non-iodized salt, fish oil, powdered shrimp, whey from spoiled milk, and paprika. How much of each? who cares? Experiment. The cabbages are the main ingredient, the rest is flavoring. 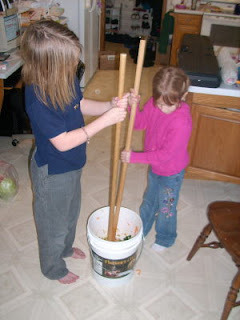 Cut the cabbage and put it in the thumping bucket. Layer the ingredients so that there is less work mixing later. 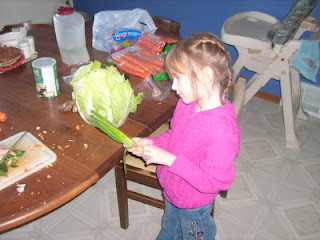 Get your kids to do some of the cutting. 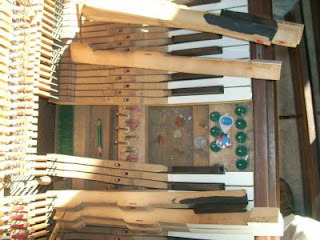 And get them to do some of the mixing and sorting. A nice layer will have most of the ingredients. Some ingredients might be specially treated. 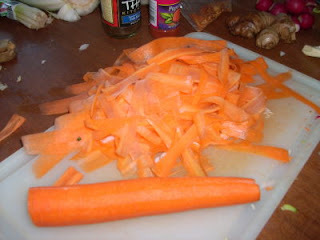 We shaved the carrots with a carrot peeler. This works nicely so that we have long pieces that are thin enough to ferment quickly. The pail nearly filled with the raw ingredients already smells good. Now it's ready for the thumping. 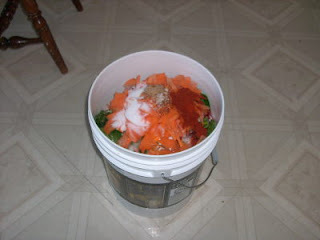 The 5 gallon pail almost filled will yield 2 gallons or so of crushed kimchi. The ingredients are crushed together so that they juice up. The whey and the lactobacillus (good bacteria from spoiled milk) cover all the ingredients. And you end up with something that you can enjoy in just a few short days. I know that each of us likes our own music. And I understand that such tastes can vary between everyone. Try out the Trinity Sessions from the Cowboy Junkies. Some tracks can be found here. Other tracks and info is here. I love this CD, the plaintive voice of Margo Timmins, the simple and strong backdrop of guitar, bass, and small drum/trap set. We missed church on Saturday because it was just too cold for someone to survive a car breakdown. Sunday we had church. 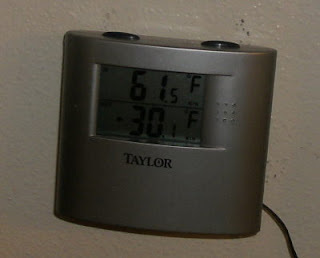 It was about 20 below, but I went to St. Petri, then Oak Park, and then Nazareth. I spent a lot of time at Nazareth. We had three annual meetings there today. I got home sometime after 4pm. I started today by driving to the first service at 7:20 am. This evening the kids were eager to watch a movie that David S. lent to me. The movie is "Prince Caspian". I like the book by C.S. Lewis. I didn't see the whole movie. But I'm both happy and sad at the movie presentation of this book. The movie focuses on th action, the battles--swords, fights and all. The book focuses on how well the character lets Aslan do what He wants. I love this book series, "the Chronicles of Narnia" and I think that W. Disney has done pretty good so far. But even W. Disney doesn't know how to deal with Aslan. How do you deal with the Creator, and Redeemer; the Second person of the Trinity when He is presented in sinful human fiction? If you are really interested post a comment. I've been playing around with the masthead for this blog. I think the pictures go by a little too fast, and I'd like to have them fade into one another. But that means a bigger file. Let me know if you like it. So, on one of the days last week we got a Jackrabbit. This should give you a bit of perspective on the size of these things. Donna is 19 months old. 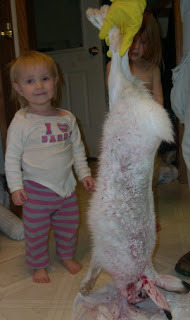 The rabbit yielded over 5 pounds of meat. I brined it for a day and seasoned it. Now we'll wait to thaw it out and cook it when Jaime brings his family. So now for the artwork. Eyelids? Yep, there was another accomplice. John was bad child #3. 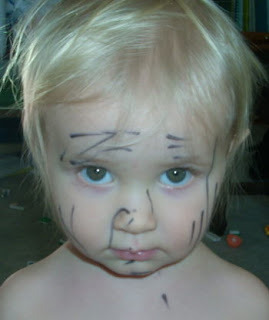 Funny, he had no marker on him. Yes, It has been a long time since the last post. No helping that. The last post was Thurs, Jan 15. That Friday was also cold. I did sermon writing. Saturday it warmed up to 12 above. We had church and Sat. School. At home I did some indoor work. George M. called. Ruby T passed away Friday evening. The funeral would take place Thursday at St. Petri. Sunday three services in the morning, dinner at St. Petri. Home, two different guests. Alyssa and her daughter came to visit Sophie. Gus came over to visit us (thanks for the bottle tree). Then off to Youthgroup meeting at St. P. Home late. Monday, pack and go to Fargo. Get new shoes and other things we cant get here. We spent the night with Pastor Thompson's family. Tuesday meetings all day. Got home late. Wed sermon writing, wed. School, funeral home devotion. Thursday Funeral at St. Petri for Ruby. Please keep her family in your prayers. I'll try to post her obit on the other blog. Joni B called. Their grand-daughter Kia, has a tumor somewhere in her eye. They're in Rochester at the Mayo. Joni will update me when she can. Please keep them in your prayers. I think Kia is about 9 years old? Is that right? Friday, I did a lot of indoor stuff. One lesson for you. 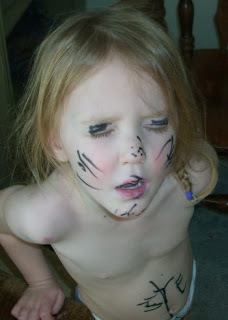 Never teach your kids the song Elvira at the beginning of a week when the temperature forces them all to stay indoors. This morning it was too cold to have church at Mt. Olive. 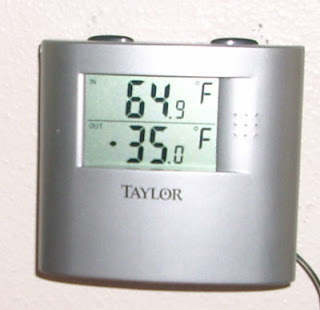 (26 degrees below zero--our safety rule for the elderly is 20 below). "an ecocritical reading of slave narratives and ante-bellum black autobiography." Knowing when to get out of academia is a life skill. It hasn't gotten above 15 below today. I think I'm going to join the group named "Minnesotans for Global Warming." 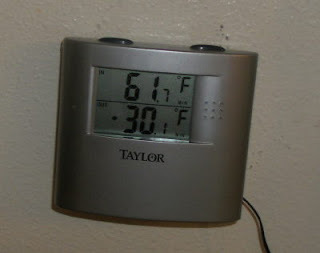 It didn't get above 20below until about half-past noon. We skipped visits and piano lessons today. Mostly we dug out the blankets and afghans. Joel, enjoy your 72 degrees. We're not really envious. We know that the cold keeps the riff-raff out of our area. Wednesday was really cold too. And it stayed cold. It did get up to about 7 below. I'm not sure what it really is. 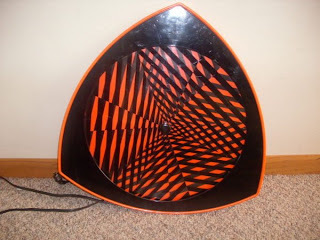 You hang it on the wall, plug it in, and it swirls with this orange and black moire pattern. Scooby and Shaggy would like it. I hope you do Alison. Just for the record. It's cold. Stella and I were up early with Inge. Mary had been up late with Inge. It might be cold outside. But not inside. Logan's parents brought him to the Sacrament of Baptism this past Sunday. I was waiting on the photo. My camera is broken. Please keep Logan and his parents in your prayers. We thank God for the gift of forgiveness in Christ that is bestowed upon Logan in his baptism. Here's the fuller picture from which the quiz photo was cropped. Click it to see more garbage! 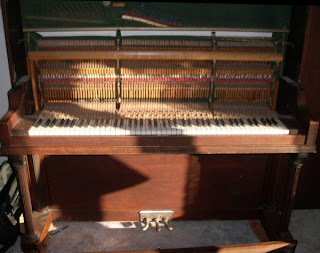 Every once-in-a-while we have to open up the piano so that the bits of crayon, pencil, coins, guitar picks, etc, can be cleaned out and have the keys work again. It's always an exciting day for the little kids. So, Alison, we can give you your prize on Wednesday. 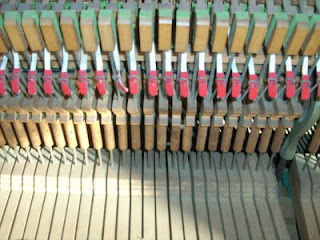 The first right answer in a comment to this blog wins the prise. 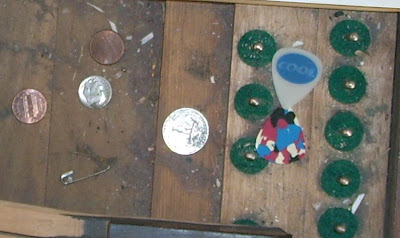 In what object are these coins, picks, pins and dirt found? For all you cold breakfast cereal fans, there has been abundant frost and snow this winter. The frosted wheats have been growing very well. These will soon be harvested, sent to the cereal companies and put into boxes. The frosted mega-wheats need a lot of cold and snow to grow to this size. These are about 6 feet in diameter. There's lots of them this year, so enjoy your bowl full. Tonight we celebrated Inge's baptism. And we thank God for His grace provided through Christ's institution of Baptism. As a pastor of four congregations I tend to get too busy to remember what's important. My role as father and my role as pastor of my own family sometimes leaves me wanting. After all, I'm only a sinful man descended from Adam. I wish we had done this when my parents were here: When my son, Jeremy, could have been here. In our family devotions this evening we baptized Inge according to Christ's institution in Matthew 28. We'll have a public affirmation of her baptism on Sunday at Oak Park. I thank God that He has allowed Inge to live until she was baptized. And we all thank God that she has been united with Christ through her baptism. Clara went to get the clam shell which we used for the baptism. Matthew got the water. All the children stood solemnly around Mary and Inge while we asked them about what God teaches in the Bible about Baptism. There's no photo here because most of the kids and Mary were in their pajamas. I'm sorry it took so long. 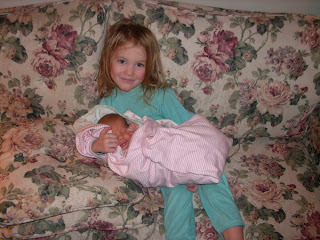 We should have done this soon after Inge was born. But celebrate with us the new birth Inge has in Christ through the Baptism Christ instituted.